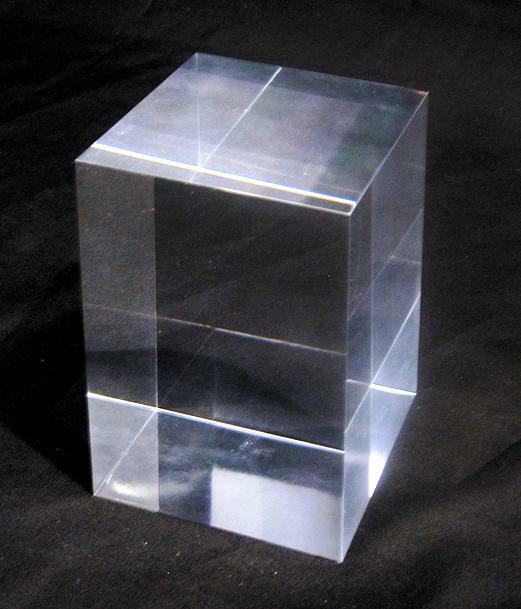 Clear Acrylic Diamond-Edge Finished Cube 4" x 4" 4". For a very high quality look we offer larger solid acrylic cubes and blocks that have crisp, sharp edges. Clear Acrylic Diamond-Edge Finished Cube 3" x 3" x 3". For a very high quality look we offer larger solid acrylic cubes and blocks that have crisp, sharp edges. Clear Acrylic Diamond-Edge Finished Block 3" x 3" x 4". For a very high quality look we offer larger solid acrylic cubes and blocks that have crisp, sharp edges. Clear Acrylic Diamond-Edge Finished Block 3" x 3" x 6. For a very high quality look we offer larger solid acrylic cubes and blocks that have crisp, sharp edges. Clear Acrylic Diamond-Edge Finished Block 1-1/2" x 3" x 3". For a very high quality look we offer larger solid acrylic cubes and blocks that have crisp, sharp edges. Clear Acrylic Diamond-Edge Finished Block 1-1/2" x 4" x 4". For a very high quality look we offer larger solid acrylic cubes and blocks that have crisp, sharp edges.